The use of concrete features indoors is not a new trend in Australian architecture. Nowadays many new buildings being constructed contain some element of exposed concrete to internal faces whether it is concrete floors, exposed concrete panels or concrete bench tops. 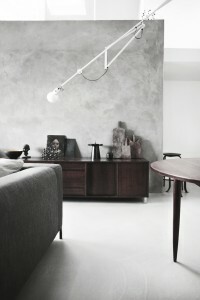 However, what if you want to create a concrete feature wall in an older building that doesn't exhibit exposed concrete? 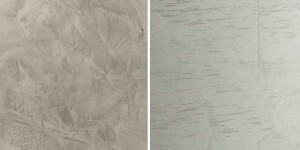 Venetian Polished Plaster is your answer; we call our concrete feature walls 'Concrete Wall'. A concrete feature wall can add that extra urban edge to any home, office or restaurant through its unique design attributes which enable it to imitate concrete not only in its visual appearance but also in how it feels to the touch. 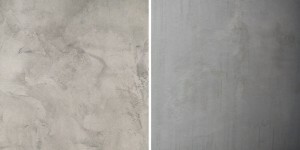 Design alternatives are endless and also adaptable due to the nature of the material that is Concrete Wall. We can create highly polished sleek concrete feature walls or if a more industrial feel is required we can alter our application techniques to achieve a more pitted or off from concrete look feature wall. We are also able create feature walls that imitate concrete blocks with horizontal and vertical lines that can be altered to display smaller or larger blocks. The character of Concrete Wall is adjustable based on the design requirements. The character of a feature wall should be based on its surroundings, the buildings context and extent of natural light entering the space. More often than not our clients tend to go with a lot of character, a lot of depth and movement within the wall. The beauty of this design attribute is that every wall is different and no wall can be re-created to look exactly the same. Design is left to the imagination with the Concrete Wall coating as well as the colour selection which is a vital aspect in achieving a finish that truly sits well within the living or work space. Depth of colour is also an important aspect to consider as the Concrete Wall coating naturally exhibits a cold setting and thus depth of colour can add a bit of warmth to the finish without altering its character. Concrete Wall doesn't require any maintenance over its life cycle as its chemical make up comprises lime and natural minerals (making it non-toxic). Over time the Concrete Wall will go through oxidization in which its chemical make up is altered as it transforms back to its original state (lime stone) without altering its appearance. PO BOX 2203 Rangeview, VIC 3132.